Reasonable people can disagree about the best way to enjoy one of the chief scammer stories of our time, Elizabeth Holmes and the Theranos catastrophe. If you prefer podcasts, you might want to start with ABC News’ The Dropout. If you’re one for addictive long-form nonfiction, you should go straight to a copy of John Carreyrou’s Bad Blood. But if you just want a quick two-hour commitment, check out Alex Gibney’s new HBO documentary The Inventor: Out for Blood in Silicon Valley. But be warned: It’s creepy. Overwhelmingly, bloodily, unblinkingly creepy, and sometimes downright gross. Here are the 11 most alarming moments from The Inventor, now available in instantly unnerving GIF form. One of the documentary’s most treasured techniques is to do odd things with images of Elizabeth Holmes. In the above scene, she enters a kind of Ramona Forever mirror situation, holding a tiny vial of blood that apparently goes to infinity. Then, in everyone’s least favorite Animorphs book, Thomas Edison’s eyes become Elizabeth Holmes. It’s also important to note that Elizabeth Holmes does not blink. And that she very frequently posed with sciencey materials, even though she was capable of doing none of the scientific work herself. 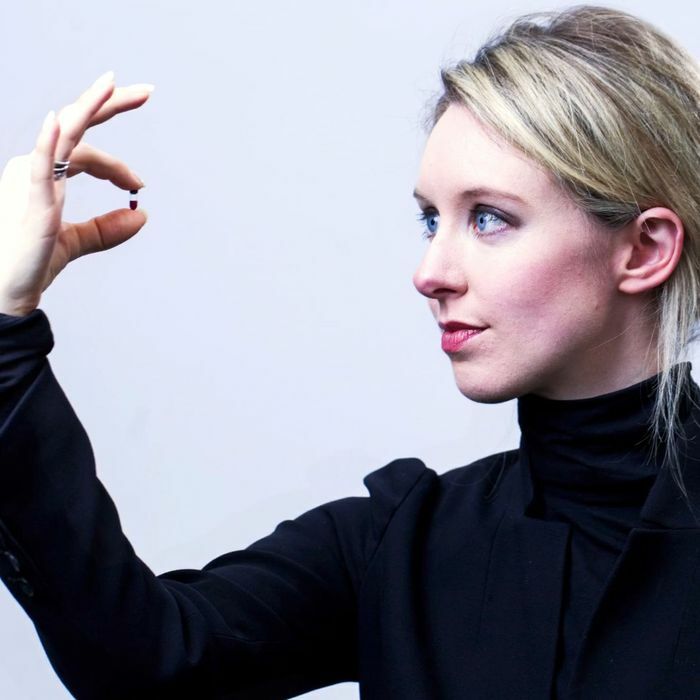 Elizabeth Holmes: the ultimate “what is she thinking? ?” face. This one’s pretty rough: THE NEEEEEEEDLE! There’s a lot of blood in The Inventor, which makes sense since it’s a documentary about blood, but yeah, things get pretty bloody. Here, Gibney imagines what it’d look like if a Theranos-built Edison machine broke and spilled bodily fluids everywhere. Is that not creepy enough for you? How about one of the sharp needles inside the Edison machine nearly stabbing a lab technician’s hand while covered in hepatitis-infected blood. Let’s pivot from blood back to doing extremely unnerving things to Elizabeth Holmes’s face, shall we? At the end of the day, there are two primary takeaways from The Inventor. First, Gibney could not get enough of Elizabeth Holmes’s face, and by the time the documentary reached footage of her dancing to MC Hammer, even that relatively tame snippet seems overly intense and scary. The second and most important takeaway is that Theranos was indeed a bonkers-level of mess, and you can take whistle-blower Tyler Schultz’s word for how bad it might’ve been if the company hadn’t imploded.